Thyme is an herb known for its culinary and medicinal uses. Individual branches of the plant, sprigs, are harvested from the plant. Fresh sprigs are what you’ll find fresh at the farmers’ market or green grocer, dried leaves are found in the Spice section of supermarkets. It is a drought resistance plant and easy to grow through cuttings. – Always wash and dry your Thyme well before cooking with it. – Thyme is usually added at the end of cooking to lend its flavor. It’s used in everything from sauces to roasted meats and stews. – Thyme can also be combined with other herbs into teas. 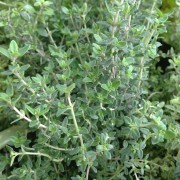 Fresh thyme should be free of yellowing leaves and black spots. To store fresh Thyme, wrap in a moist paper towel and in air tight bag, in the refrigerator. It will not keep well past a week. In Medieval Europe, people would sleep with a sprig of thyme under their pillows to invite peaceful sleep and ward away nightmares!